Can You Save Your Insect Friends? There's a battle taking place in your backyard, and only you can save the day! 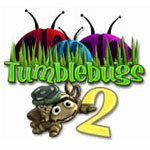 With Tumblebugs 2, your insect friends are being held captive and only you can rescue them. Discover awesome power-ups, unique bonus rounds, collect golden rings and experience rapid fire color-matching! If you love solving puzzles or if you are simply looking for a fun way to spend some spare time, this family-friendly game is sure to keep you engaged. The Black Bug King is developing a plan to capture and enslave all of the tumblebugs in the neighborhood. As a ladybug named Tumble, you will attempt to thwart the Black Bug King's plans and save all of your insect friends before they enter his lair. Tumble is located in the center of your screen and is able to rotate 360 degrees. A long string of captured insects (multicolored balls) rotates and surrounds you on all sides. They are all swirling towards a hole located in the ground. To free the imprisoned bugs, you must launch colored balls at this long string and try to make a match of at least three like-colored balls. With your mouse cursor, you are able to aim exactly at a specific color group within the chain of insects. If the current ball is of no help to you, you can easily discard it by launching it into an empty space. You can score bonus points by freeing several groups of bugs in a row. To maximize your total points, try to free numerous pairs in a row. This will create a chain that allows you to rack up points and increase your score significantly. If you succeed, the line of balls will gradually shorten and you will win the level. If you are unable to free all of the multi-colored insects in time, they will fall into the hole and you will need to start over. For an added challenge, some levels will feature a slight twist. During a frenzy round, the balls will circle around at a rapid pace and you will have to work quickly to eliminate all of the colored balls. Other bonus rounds challenge you to free as many insects as you can within 45 seconds, collect letters to spell words or collect gold rings. For every 25 gold rings you can collect, you will receive an extra life. 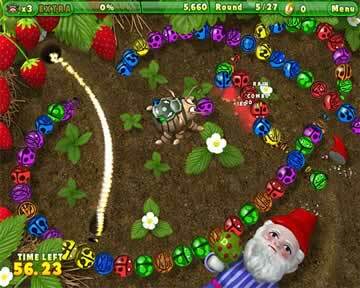 Ballistic bugs: With the ballistic bug power-up, you can easily aim at insects that are blocked by the first row of bugs. Gap bugs: The gap bug makes a huge gap in the chain of insects and briefly stops the line from moving. Homing bugs: If you are having difficulty aiming at a particular color, the homing bug power-up increases your accuracy by automatically going towards the nearest insect of that color. 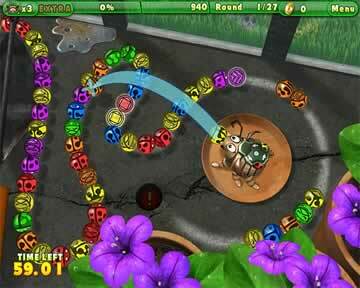 Color bugs: Using the color bug power-up eliminates all bugs that match its color. During endless mode, a never-ending chain of bugs will keep appearing. Your game only ends when all of your lives are spent. The pressure is on while playing rescue mode. This mode challenges you to complete 27 unique rounds in one hour.